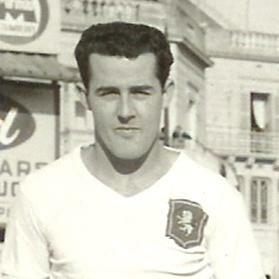 Walter Bone had a distinguished career with Valletta, his hometown club. In football, there are many types of players. Some are artistic and delight the crowds with their ball control. Others are fast and rely heavily on their speed to beat an opponent. There are intelligent players who use their wits all the time to read developing situations and others who use their strength and all-out endeavour to stop opponents. Walter Bone was definitely one of the latter. Born in Valletta on June 7, 1935, he started playing football at Stella Maris College in Gżira and, at the tender age of 11, was already being chosen to play for the school’s first team. The Citizens won that game 2-0 with goals from Frankie Zammit and Silvio Rapinett. Bone played his usual solid game at right-back and this marked him as a good pro-spect for the future. It was a good time for a young player to command a place in Valletta’s first XI because the Citizens were in the process of building, perhaps, the greatest team in their history. By 1958, apart from Bone, the team had legendary players like Tommy Taylor, Edwin Schembri, Joe Cilia, Charlie Mackay, John Darmanin, Jackie Grech, Joe Zammit, Josie Urpani, Mario Azzopardi, Frankie Zammit and Alfred Borg in their ranks. The next season, Valletta went one better. They retained the championship crown and won the FA Trophy for the first time in their history after beating their bitter rivals Floriana 3-0 in the final with two goals from Azzopardi and one from Zammit. Bone was a no-nonsense defender and wingers like Pullu Demanuele, of Floriana, Sammy Nicholl, of Sliema Wanderers, and Frans Xuereb, of Hibernians, were sure to feel the full force of his tackles. Bone’s story is that of a local boy making it good in football. His only disappointment was perhaps that he was never capped by the national team. In his days, international matches were few and far between and it was easy for a player to miss the chance of representing his country.